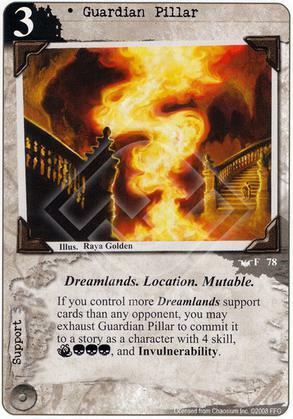 If you control more Dreamlands support cards than any opponent, you may exhaust Guardian Pillar to commit it to a story as a character with 4 skill, (T)(C)(C)(C), and Invulnerability. be committed as a character to a story. does retain its name and uniqueness. A: No, Guardian Pillar as a character is a "virtual" card, meaning it contains no printed characteristics associated exclusively with a character card. It maintains its subtypes and cost, but skill and icons are not printed but gained. Anything that refers to printed cannot target or otherwise effect those gained characteristics positively or negatively. Pillar vs The Silver Key (SftSK) Pillar is not a ready character, it becomes character after he exhausts, so Silver Key doesnt prevent him from commiting and readies him. I really wish I could run this in a deck along with Cavern of Flame, but if I'm running Hastur I can't imagine not wanting Stygian Eye. I might try out a more Dreamlands-oriented Hastur build and see what happens someday. Disregarding the Restricted status, though, this card is a beast. I feel like it should have had a faction association though, which would probably save it from the Restricted list. A lot of support hate hits locations. The effect is conditional - less likely against Hastur for example. As a restricted card I think its tough to put into a deck. If not restricted it becomes an auto include in many decks - a reason for its restriction I suppose. The power of this card should be obvious, this gives every other restricted card a run for its money. Expect to see this a lot, especially if your meta is removal heavy. If I have Artifact of the Lost Cities attached to Guardian Pillar, and then Guardian Pillar is put into the discard pile while it is a character, does my Artifact of the Lost Cities still trigger? Artifact of the Lost Cities specifically says "when attached support card," but in my scenario, the Pillar isn't a support card when it dies. I assume I don't get the 3 cards, but I figured I'd ask. I agree, the use of "support" in the response, seemingly redundant at first glance, becomes relevant here and you don't get your three cards.